Applicants registered for an Apprenticeship will be eligible for this card. Applicants must complete the 1 day CSR Health and Safety Training and provide proof of registration on an Apprenticeship. On achievement of NVQ Level 2, apprentices upgrade from a red card to a blue card. Apprentices should upgrade to a gold card when NVQ Level 3 is achieved. 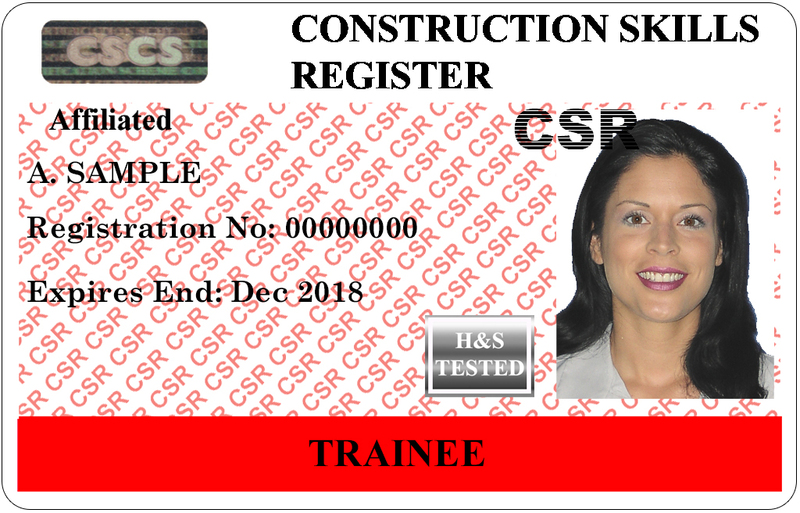 The trainee card is available to applicants with limited construction experience who are in the process of completing a construction related NVQ qualification. Applicants must complete the 1 day CSR Health and Safety Training and provide proof of registration on an construction related NVQ qualification. The Trainee card cannot be renewed. On achievement of NVQ Level 2, trainees should upgrade from a red card to a blue card. Trainees should upgrade to a gold card when NVQ Level 3 is achieved. Valid GCO cards continue to be accepted until their expiry date. The green card is available to applicants who carry out basic site skills only. Applicants must complete the 1 day CSR Health and Safety Training and Occupational Assessment. The green card will also be issued to those operatives whose occupations do not fall under the remit of the Joint Council for the Building and Civil Engineering Industry (NI) and therefore no occupational assessment is available. In this instance applicants complete health and safety training only. This card is available to those engaged in a labouring occupation. Applicants must complete the CSR 1 day Health & Safety Training and have an employer declaration completed confirming the applicant is working in a labouring occupation. The Blue Skilled Construction Operative card is available to applicants with experience on site. Applicants must complete the CSR 1 day Health and Safety Training and Occupational Assessment. Please note the Occupational Assessment route is being withdrawn on 1 September 2019. The Blue Craft card is available to Craftsmen who have completed the CSR 1 day Health and Safety Training and NVQ Level 2 in a craft occupation or an occupational assessment based on NVQ 2 standards. Applicants must complete NVQ Level 2 ‘Accessing Operations and Rigging - Scaffolding’ and the CSR 1 day Health and Safety Training and the Scaffolder’s Touch Screen test. Occupational assessment is not available for scaffolding. 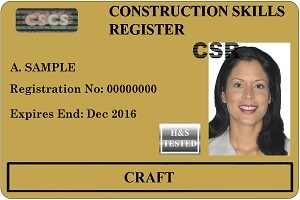 The Gold Craft card is available to Craftsmen who have completed the CSR 1 day Health and Safety Training and NVQ Level 3 in a construction related occupation or an occupational assessment based on NVQ 3 standards. Applicants must complete NVQ Level 3 ‘Accessing Operations and Rigging - Scaffolding’ and the CSR 1 day Health and Safety Training and the Scaffolder’s Touch Screen test. Occupational assessment is not available for scaffolding. 1. The white card is issued to applicants who do not have a National Insurance number. Applicants must complete the 1 day CSR Health and Safety Training and appropriate occupational assessment. This card is valid for one year and may be upgraded when the cardholder has received a valid NI Number. 2. The white card is also issued to applicants with no experience in the construction industry. Applicants must complete the 1 day CSR Health and Safety Training. This card is valid for one year and may be upgraded when the cardholder has completed an occupational assessment. The Visitor card is for those who frequently visit a construction site but do not carry out construction tasks on site. Applicants must complete the CSR 1 day Health and Safety Training.